I live in Maine so I love seafood and whenever I get a chance I eat it and I recently found Matlaw’s Stuffed Clams at my local supermarket and knew I had to try them. I got New England Style Stuffed Clams which comes in a nine pack to review and they each are elegantly served in a natural shell and loaded with a classic blend of golden breadcrumbs, succulent chopped clams, minced celery, red and green peppers; and sprinkled with paprika and parsley. My Opinion: I really enjoyed the flavor of these stuffed clams and it is such a great addition to my meal all year round and the price for these are what you expect very reasonable. They take about 30 minutes to bake in the oven. 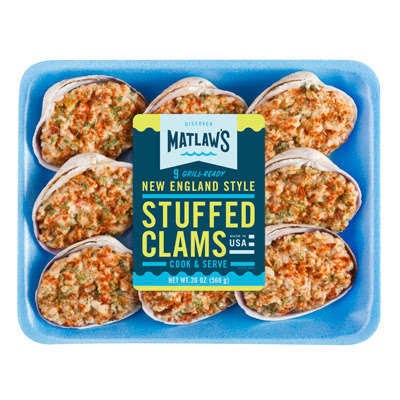 The 9 pack of New England Stuffed Clams are on sale at Stop and Shop (New England and NY) stores from May 15 to July 11th at $3.99 marked down from $5.99! Make sure to pick some up today as July 4th is around the corner! I also found these on sale at my local Shaw's. Matlaw’s also has Coconut Popcorn Shrimp, Buffalo Popcorn Shrimp, Cod, Salmon and more.